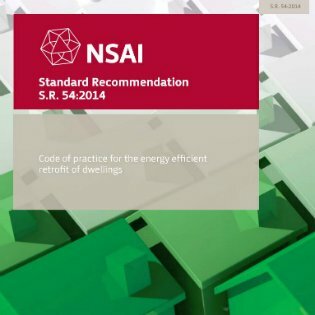 NSAI Code of practice for the energy efficient retrofit of dwellings. This publication by the National Standards Authority of Ireland provides technical guidance on the energy efficient retrofit of a domestic dwellings. 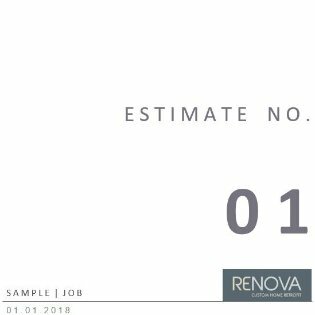 Although published in 2014 after RENOVA commenced the deep retrofit of dwellings, we are pleased to say that the technical details in this publication tally in all cases with established RENOVA practices. SEAI Guide to Renovating an Older Home. This publication by the Sustainable Energy Authority of Ireland provides a good overview of the measures you need to consider when renovating an older home. Although it doesn’t explore retrofit in great detail, it does provide a good starting point from which to learn about the ins and outs of home renovation. SEAI Guide to Insulating Your Home. This publication by the Sustainable Energy Authority of Ireland provides a very detailed overview of what is involved in insulating your home. It deals with all aspects of insulation, and also contains information on Draught Sealing, Condensation, plus an overview of ‘U-Values’ and what they mean. You probably haven’t considered Health & Safety when thinking about your home renovation project. But by law you must consider it. The law states that homeowners must appoint a competent individual to supervise the design and construction of their renovation project … in writing. This guide explains it all. This simple leaflet provides a summary of the grants available for energy improvement works at your home.For full details on SEAI grants go towww.seai.ie/Grants/betterenergyhomes/homeowner/. Remember that all works to be grant aided must be carried out by approved contractors. Thinking Deeper Financing Deep Retrofit by IIEA. For those readers who wish to learn more about Deep Retrofit, this publication by the Institute of International and European Affairs makes a very interesting read. The purpose of the document is to explore the future financing options for the roll out of Deep Retrofit in Ireland. What it goes to show is that if you are considering a Deep Retrofit, you are in the vanguard, as are RENOVA, of promoting Deep Retrofit. Ventilation and Insulation go hand in hand. A modern insulated home must be adequately ventilated to prevent condensation and associated problems such as mould growth. This video by Aereco explains how their Demand Controlled Ventilation system works. This system is favoured by RENOVA as an economical and practical ventilation solution in a retrofit situation. This video by Isover demonstrates the use of the Isover Optima Dry-Lining system. This system must be used when insulating an old brick or stone wall – one that needs to breathe. This is the system we employ at RENOVA. Old walls do not have a Damp Proof Course and the way they remain dry is by ‘breathing’ which allows moisture to escape. Another video by Aereco. This animation explains the basic principles of ventilation, why we need it and the consequences of not being adequately ventilated. Maybe you’ll watch this video and understand why your house has a problem with condensation and mould growth. The solution is normally ventilation. Another video by Aereco. This video looks at 4 common ventilation systems found in homes: Natural Ventilation with Intermittent Fans, Passive Stack, Mechanical Extract Ventilation and MVHR. At RENOVA we find that the Aereco Demand Controlled Ventilation system is the best fit for the typical Irish deep retrofit scenario. So how does the ISOVER Vario Membrane work? This video by Isover explains how their Vario vapour control membrane works. This video demonstrates that in summer the membrane allows a relatively humid wall to breath so that moisture from the wall can escape through the drylining system into the building. In winter the relatively humid air in the room is prevented from passing through the membrane into the wall. This video by Xtratherm demonstrates one method to dry-line an external wall. This is the method we favour at RENOVA. The advantage of this method is that it creates a ‘service void’ on the room side of the insulation. This avoids the need to ‘chase’ into block walls for services or to remove sections of the insulation to make space for services. This video by Isover demonstrates the principles involved in insulating your attic. It’s essential to take time to prepare the attic space for wiring and pipework. Ventilation space at the eaves needs to be maintained, and make sure to insulate the water tank and pipework. At RENOVA we always install an insulated, draught proof attic hatch and ladder, but this video shows a less elaborate method which also works well. This video by Isover illustrates the principles of air-tightness very well. It shows how tapes are used at the junction of first floor ceilings and perimeter walls, at the perimeter of windows and where walls meet the ground floor. The use of tapes and sealants at these locations is a whole new pursuit and would not have been done even 5 years ago. At RENOVA we always make allowance for ‘Air-Tightness’ in our renovations. This animation by Dimplex illustrates how an air to water heat pump works. Although this video is an advert for Dimplex, it does a good job of explaining the system. One thing you’ll notice is that a heat pump is just one component of an overall system. If you’re considering a heat pump then all other components of your heating and plumbing must be designed to suit. ‘This Old House’ – our favourite TV Show! In this video Tom Silva (America’s answer to RENOVA! ), demonstrates various insulation materials and their application. It highlights the advantages and disadvantages of the various techniques. Although the applications discussed relate to the construction of American timber buildings, the principles relating to the different materials are the same for Ireland. There is no ‘best’ insulation, it always differs from house to house and budget to budget. 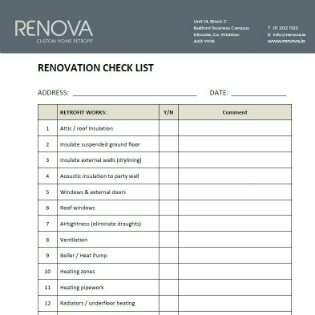 This check list contains most of the works that are usually considered for domestic renovations. The list is divided into Retrofit Works and Fit Out & Finishes. When we meet we will go through this list together and select the works that need to be considered on your project. The additional services listed are works that are carried out by third parties, but managed by RENOVA for a turnkey service. 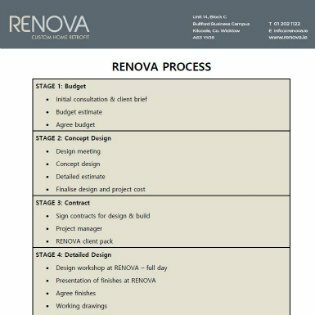 At Stage 2 in the RENOVA process we prepare a Detailed Estimate for the works. This is a comprehensive document that details all of the works included in the concept design proposal. Any qualifications or excluded items are clearly identified. At RENOVA our pricing is always honest, transparent and accurate.